How come that these big companies that advertise their mega-ultra ability to research usability issues simply forget about them? 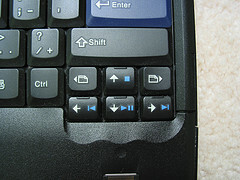 New Thinkpad notebooks from Lenovo (formerly IBM) now come with a back and forward set of keys close to the arrow keys ("close" is the wrong word here - I should say they are all around the arrow keys - see the picture). These keys are there for web surfing purposes: you can easily move back or forward on your preferred browser without using the mouse. It is a nice idea but the location chosen could not be worst. It is very common to accidentally press one of those two buttons when touching for the arrow keys. Our brain is used to the fact the arrow keys are harmless (think about it, arrow keys only move pointers or focus around - they don't delete anything). We press anything around that "arrow keys" area without thinking. But the back/forward keys are evil. They ignore the fact you might be adding data to a certain text box and send you away from that page. You can end up spending a couple of minutes writing an email for instance just to lose it by clicking accidentally the back key when you just wanted to move the cursor one position to the left. These new keys are not only evil but also useless. For years I have moved backward and forward when surfing the internet by using Ctrl + (Left/Right). Ctrl + Left means back and Ctrl + Right means forward. Straight, simple and, above all, safe (you really know what you are doing). Not to mention the fact that this functionality has been available for years. For those with the same problem follow these steps and remove this extra pain from your back.